We are starting a new program to encourage members to “ADOPT A TRAIL” on our trail system. Members would clean and maintain the designated area throughout the season. We are asking members to sign up and become involved. We are hoping to see new members, groups and families participate. 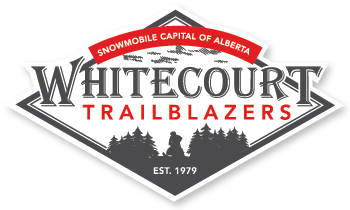 If you are interested in volunteering, please contact Aaron at 780-779-3372 for more information and to put your name on a trail. If you are interested in purchasing a canvas please email cindy@whitecourttrailblazers.ca The cost of the canvas is $37.50. It’s here! We are having our 1st general meeting of the season on September 9, 2015 at the Legion (downstairs) – 7:30pm. We have 2 special guests attending from the Alberta Snowmobile Association – President Lyle Birnie and Zone Representative Debbie Westman. Come and join us for a short meeting and snacks. Newbies welcome!